Reliance Jio will give 100% cashback Jio vouchers, online shopping vouchers and discount coupons for prepaid subscribers recharges of rupees 399 and above; user will gate cashback benefits up to rupees 2,599. Reliance Jio announced a limited-period scheme, named Jio’s Triple Cashback Offer and the Offer is valid between 10th November and 25th November 2017. Under the offer category, Jio is offering vouchers up to rupees 1,899 per recharge with its e-commerce partners. 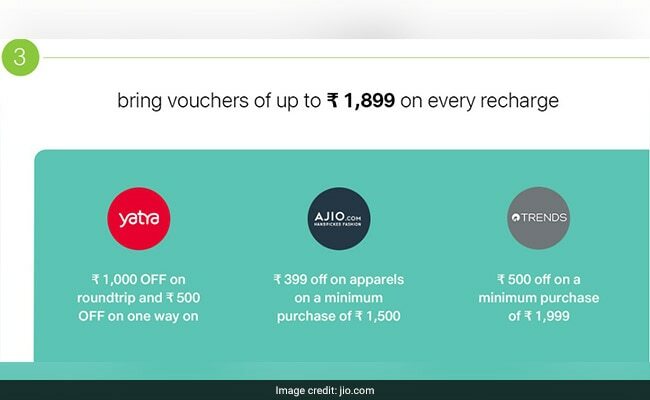 This offer includes a rupees 399 off on apparels on a minimum purchase of rupees 1,500, according to Jio official website. Reliance Jio Company has partnered with major mobile wallets like Amazon Pay, Paytm, PhonePe, MobiKwik, Axis Pay, and Freecharge to give a certain amount as instant cashback offer. New recharge User via Amazon Pay will get rupees 99 instant cashback while existing recharge users will get rupees 20. 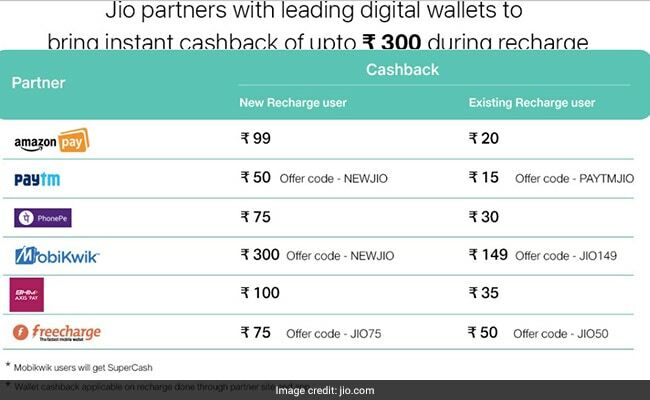 Similarly, new recharge users will get instant cashback of rupees 50 on Paytm, rupees 75 on PhonePe, rupees 300 MobiKwik, rupees 100 on Axis Pay, and rupees 75 on Freecharge respectively. Existing recharge user wil get rupees 20, 15, 30, 149, and 35 instantly on Amazon pay, Paytm, PhonePe, MobiKwik, and Axis Pay respectively.